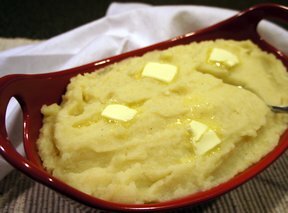 If you are looking for a substitute for mashed potatoes, you found the recipe you are looking for. 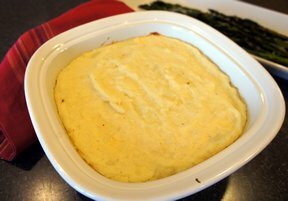 This side dish is full of flavor and soon will be requested over the traditional mashed potatoes. These amazingly flavorful potatoes are actually made with mainly cauliflower, making it a healthy but delicious side dish. Cut the cauliflower into 1 inch pieces. Peel the potato and cut into 1/2 inch pieces. Add the cauliflower, potato and garlic to the boiling water. Continue to boil for 16-20 minutes, or until the vegetables are soft, but not falling apart. Drain well in a colander and shake dry. 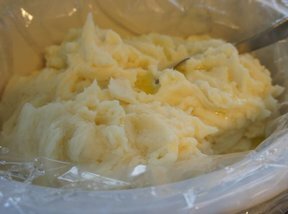 Add the cauliflower, potatoes, and garlic to the bowl of a food processor and process until smooth and creamy. Add butter, milk, and 4 tablespoons of the cheese. Process until very smooth. Add salt and pepper to taste. Serve immediately, sprinkled with the remaining Parmesan cheese. NOTE: If you are making the mixture ahead of time, spoon into a shallow casserole dish sprinkled with the cheese. Bake at 350° until heated through and golden. "Made this last night to go with our Beer Can chicken. 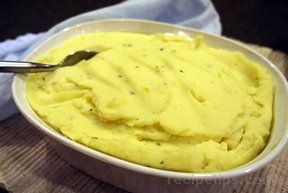 I've always heard people talking about mashed cauliflower and now I know they are right. My family loved it!"